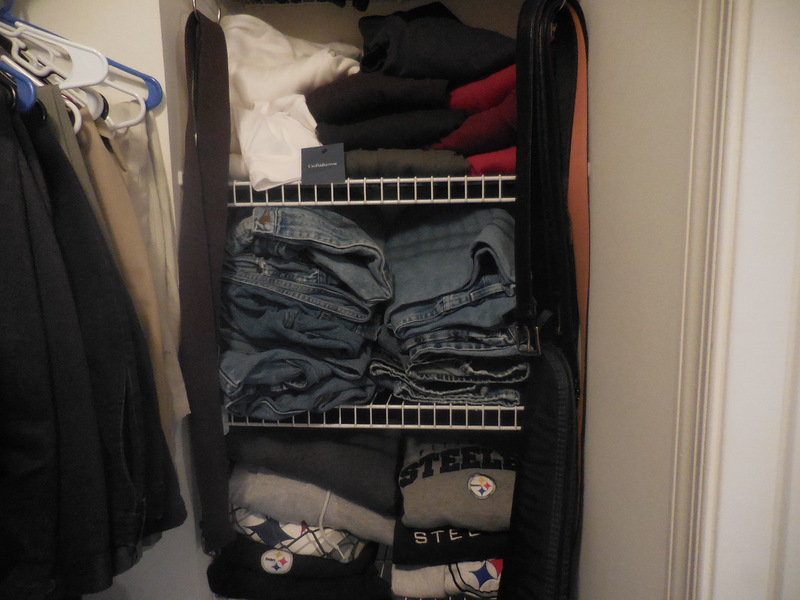 This morning on my Facebook feed was a post by Peter Walsh on the 31 Day Get Organized Challenge. I don’t know about you, but it seems like in January that you just want to get organized. Maybe it’s because of the all the chaos of Christmas, having all the decorations up, the tree, the presents, the opening of the presents (always a big mess) and by the time New Year rolls around we just want normal again. I have to admit, last year, a lot of things got put on hold in my house because of my husbands surgery and recovery. As I stated before, in July, he had back surgery and spent 28 days in the hospital/rehab to regain use of his arms and legs. After he got home, it was running to rehab therapy 3 times a week, not to mention doctor appointments. Unable to walk that well, we just decided it was easier to put his clothes into the clothes basket. 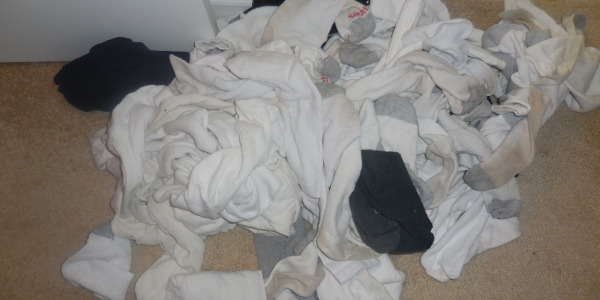 He was wearing T-shirts, shorts and sweat pants for several months. 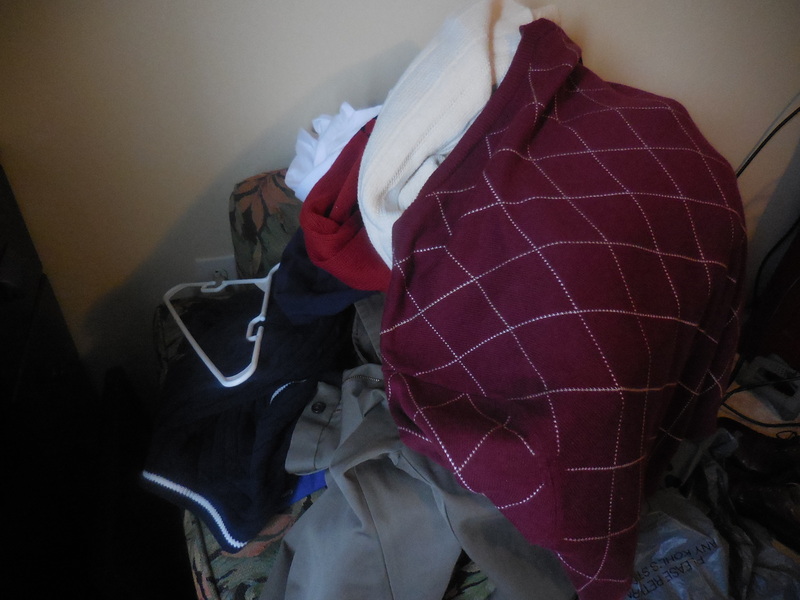 Now, that he’s back to work, we have added sweaters, turtlenecks, shirts, dress pants to this pile only these are on the chair in the bedroom. It’s been almost 6 months and we need some “normal” back into this situation. It’s time for an intervention!!!! The 30 day challenge is exactly what I needed to get motivated! You are supposed to spend 10 minutes a day folding laundry. TODAY was the first day of the challenge. So, I folded and folded, and to my surprise, it probably didn’t take more than 10 minutes to do this. 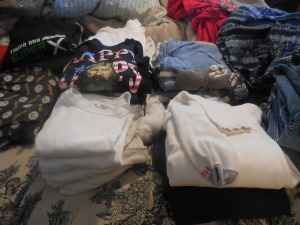 The question is now, what do I do with the folded clothes? I see how this challenge works…it gets you motivated to do one thing, so that you HAVE to do the next thing. Which led me to the closet, thank goodness it has a door on it!! 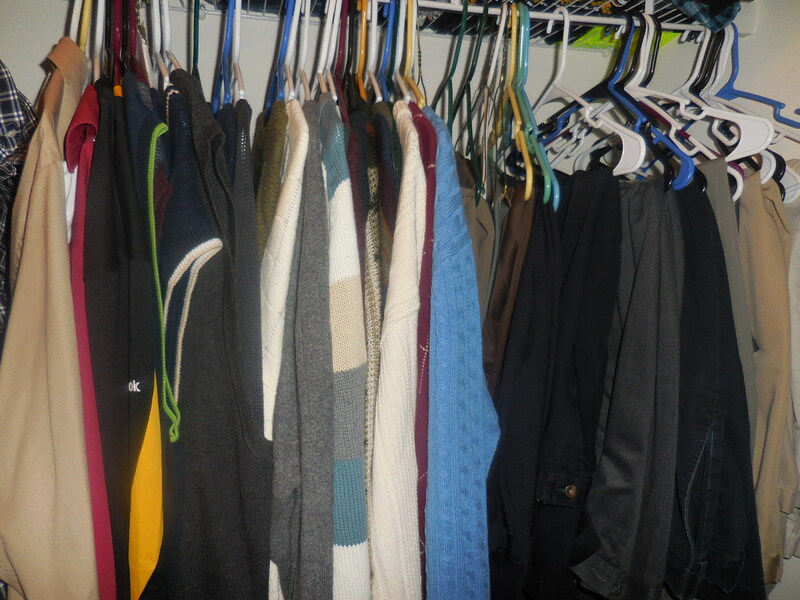 All his summer shirts are still hanging in front, so I moved them to the upper clothes rack on the left side and pulled all the sweaters down from the pile on top of the clothes rack. 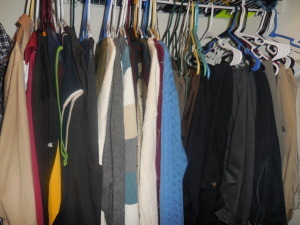 Sweater vests, sweaters and dress pants! Right where he cans SEE them, you know how men are, it can be right in front of their face and they can’t see it…or is that just my hubby? 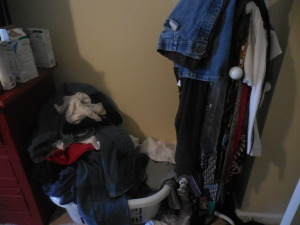 This is a nice size walk-in closet with a 12 foot clothes rack with shelving all the way across the top and 3 foot on the left side with two hanging shelves for shorter items, five shelving units are on the rights side. All his sleeveless and shorts from summer were still on the shelves on the right side of the closet. Those got moved to the top shelf– long sleeved sweatshirts, turtle necks and blue jeans took their place. That took a good 45 minutes to move and fold everything. Now let’s open the dresser drawers! His dresser has one drawer on top, 3 small drawers on the side, 2 large drawers on the bottom and a door that opens up to reveal two shelves. The 3 small drawers hold all his socks…this is the pile of unmatched socks I pulled out of those drawers. 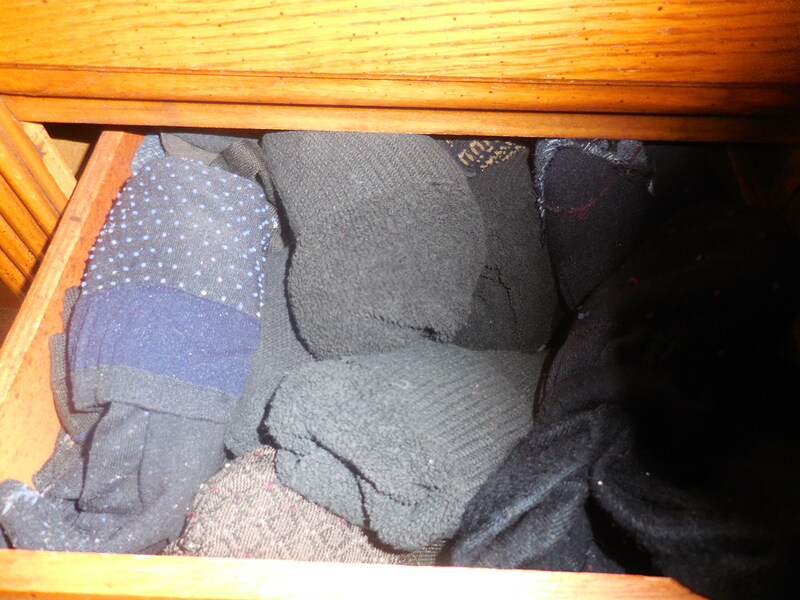 I know there are matches in this pile somewhere, but he still has a drawer full of white socks, do I really have to take the time to match them? I don’t think so!!! 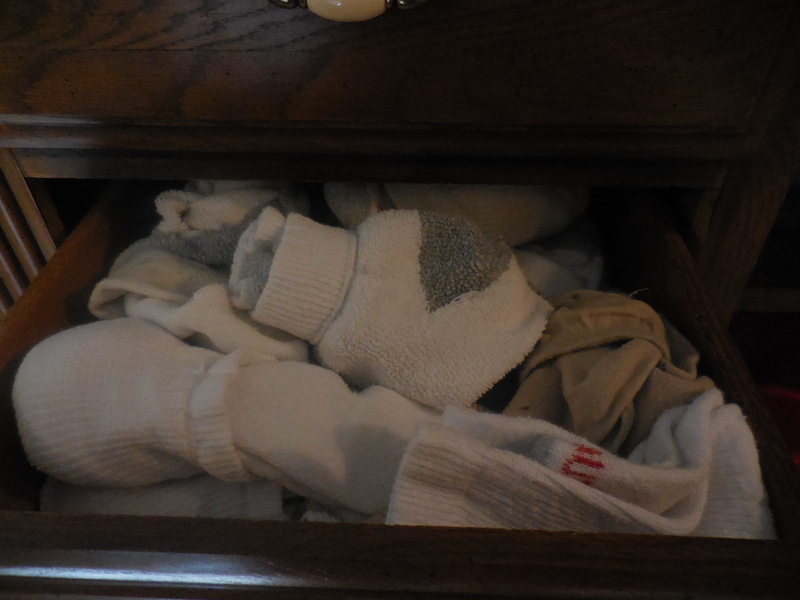 These are the matched socks he has– this drawer is all white socks! 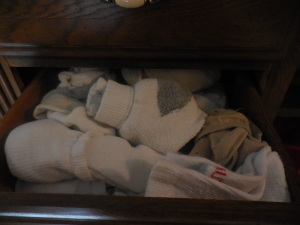 and the bottom drawer are all his dress socks! 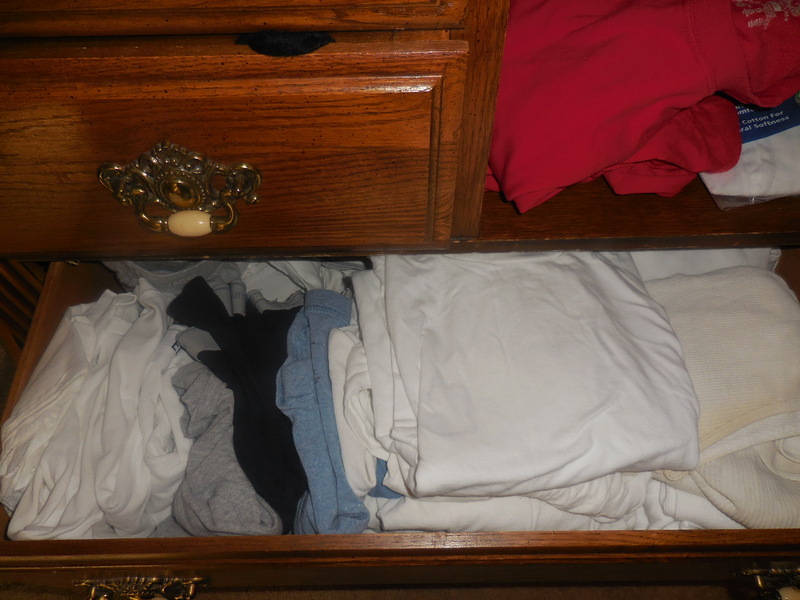 The large drawer on the bottom, I put all his undergarments, briefs, white short- sleeve T-shirts, and his white sleeveless T-shirts. The two shelves inside the drawer of for the blue-jeans he wears most of the time…the rest are on the shelf in the closet. 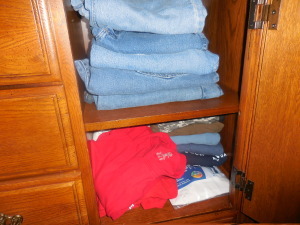 I counted 25 pairs of blue jeans, and he told me the other day he needed new ones, I wonder why? Because they were all hidden in the closet! The other shelf holds all his workout shirts, you know the ones that he got free at Rehab! 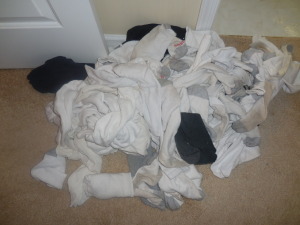 lol…I was going to get rid of them, but he likes them because they are cotton and they are comfortable! Okay, he can keep them for a while longer! It took a few hours to accomplish all this, but the feeling you get having it all organized and being able to see the floor in the bedroom is WORTH IT!!! 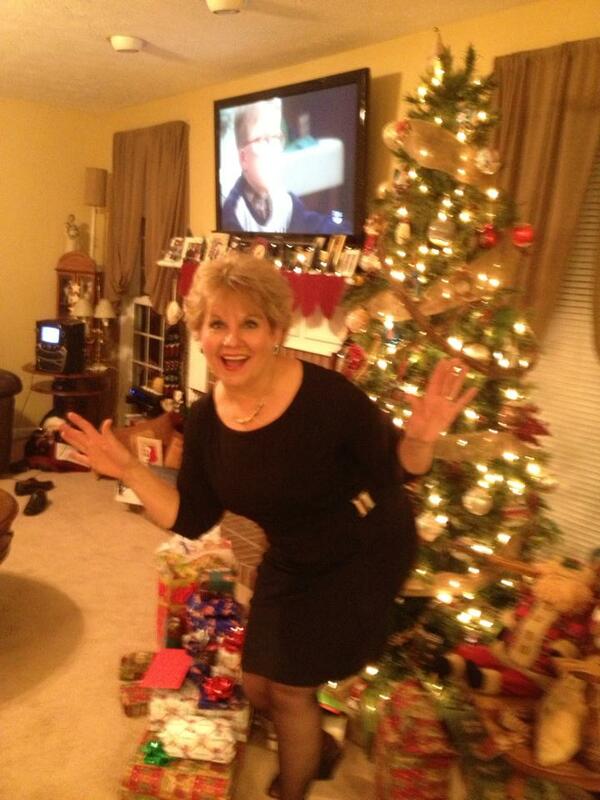 And, to have your hubby make a post on Facebook that he can find things now and it’s WONDERFUL!! I can’t wait to see what tomorrows challenge is…will you join me? Let me know! If you want to follow Peter Walsh’s 31 Day challenge on Facebook click HERE!